Libcom.org's reading guide on the Spanish civil war and social revolution from 1936-1939 which, sparked by a military rising lead by right-wing General Franco, was arguably the most far-reaching revolution in history. 1936-1939: The Spanish civil war and revolution - Short history and overview of the events that took place in the Spanish civil war and revolution. Homage to Catalonia - George Orwell - Classic account of Orwell's experiences in the civil war and its betrayal by the Spanish Communist Party. Anarchists in the Spanish revolution - Jose Peirats - A lifelong member of the CNT gives his account and analysis of the Spanish civil war. The tragedy of Spain - Rudolf Rocker - Excellent book analysing the Spanish civil war by a leading anarcho-syndicalist. 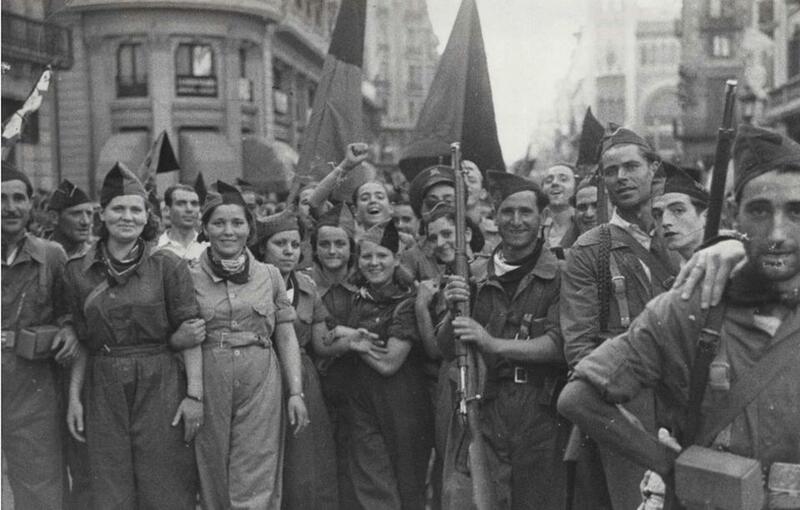 Workers' power and the Spanish revolution - Tom Wetzel - Historical article and analysis of the Spanish Civil War and Revolution, and in particular the activities of the Spanish anarchists within it. The CNT in the Spanish Revolution - Jose Peirats - Extensive, three volume work by chronicling the history of the Confederación Nacional del Trabajo (CNT - "National Confederation of Labour"), the anarcho-syndicalist union and largest workers' union in Spain at the time during the Spanish civil war and revolution 1936-9. CNT - Confederación Nacional del Trabajo, an anarcho-syndicalist union founded in 1910 which during the civil war boasted 1.5 million members and was easily its most influential organisation. FAI - Federación Anarquista Ibérica, an anarchist political organisation active both within and out of the CNT. Friends of Durruti - Anarchist group founded during the civil war opposing the CNT's participation in the Republican government. Mujeres Libres - Anarcho-syndicalist women's organisation active within the Spanish CNT before and during the Spanish revolution. POUM - Partido Obrero de Unificación Marxista, an anti-Stalinist communist political party which was severely repressed by the Spanish Communist Party. George Orwell served as a member of one of their militias. Buenaventura Durruti - Legendary anarcho-syndicalist rail worker, CNT member and military leader, killed during the Spanish civil war. 1936-1939: the Spanish Civil War - Augustin Souchy - Excerpt from his autobiography, Beware! Anarchist: A Life for Freedom, recounting his time in Spain. Spilling the Spanish beans - George Orwell - 1937 essay on the lies in the British press obscuring the revolutionary character of events in Spain in favour of a simple story of 'democracy vs. fascism'. Was there a Spanish revolution? - Enric Mompo - Essay on the nature of the Spanish civil war summarizing the historical background of the military uprising and that immediately after, spontaneously formed committees and workers patrols replaced the state throughout most of Spain, providing “irrefutable proof of the socialist character of the Spanish Revolution”. The Tragic Week in May: the May Days Barcelona 1937 - Augustin Souchy - Account of the fighting in Barcelona in May 1937 when the Communists consolidated their hold on power and turned decisively against the anarchists and revolutionary workers. We the anarchists! A study of the Iberian Anarchist Federation (FAI) 1927-1937 - Stuart Christie - Excellent history of the Iberian Anarchist Federation, which played a key role in the Spanish civil war and revolution, from 1927 to 1937. The Friends of Durruti Group: 1937-39 - Agustin Guilamòn - In-depth study of the hugely important anarcho-syndicalist CNT militants who opposed their union's collaboration with the Republican government during the Spanish Civil War. The anarchist collectives: workers' self-management in the Spanish Revolution 1936-1939 - Sam Dolgoff - First book in English devoted to the experiments in workers’ self-management, both urban and rural, which constituted one of the most remarkable social revolutions in modern history. Collectives in the Spanish Revolution - Gaston Leval - Detailed account of worker-controlled agriculture, industry and public services in revolutionary Spain during the civil war. Industrial Collectivisation during the Spanish Revolution - Deirdre Hogan - Article focusing on the collectivising of industry which took place in the urban centres of Spain. An account of agrarian collectives in Aragon - Augustin Souchy - An account of the workings of rural agricultural collectives in Aragon, revolutionary Spain, 1936-39. La Révolution Espagnole: The collectivized CNT taxis - Article from the POUM's newspaper La Révolution Espagnole in 1936 on the CNT's collectivised taxis during the Spanish civil war. Battle for Spain: the Spanish Civil War 1936-1939 - Antony Beevor - Excellent military history of the Spanish civil war by a mainstream historian. The Spanish civil war: Revolution and counterrevolution - Burnett Bolloten - Exhaustive account of the period from 1936 to 1939. Story of the Iron Column: militant anarchism in the Spanish civil war - Abel Paz - History of the legendary Column who fought fascism and resisted attempts to turn them into a regular military outfit. A Day Mournful and Overcast... An account of the Iron Column - Personal account of a liberated prisoner's experience as a fighter in the Iron Column prior to its incorporation into the Communist-run Republican army. A soldier returns - letter from an American fighter in the Durruti Column - Letter from an American trade unionist and member of the Industrial Workers of the World about his experiences as a fighter in the International section of the anarchist Durruti Column. The Foreign Legion of the Revolution - Interesting article focusing on the activity of exiled German anarcho-syndicalists in Spain, both in the lead up to and during the Civil War and Revolution of 1936.
International volunteers in the POUM Militias - Andy Durgan - Written by the historical consultant for Ken Loach's film Land and Freedom, the article also contains a list of international volunteers in the POUM militia. Women in the Spanish revolution - Solidarity - Excellent pamphlet by Liz Willis of Solidarity on the conditions and role of women in and around the Spanish Civil War and revolution of 1936-1939. History and actuality of anarcha-feminism: lessons from Spain - Marta Iniguez de Heredia - A look an anarcha-feminism in practice, using women's activism during the Spanish civil war as a case study. Free women of Spain - Martha A. Ackelsberg - In-depth book on the free women of Spain, Mujeres Libres. Spanish Civil War and Revolution photo gallery, 1936-39 - Photo gallery of anarchists and other workers attempting social revolution in Spain 1936. Spanish Civil War and Revolution poster gallery, 1936-39 - Archive of posters from the Spanish Civil War and Revolution, 1936-39. Living Utopia - A unique feature-length documentary chronicling the origins and evolution of the Spanish anarchist movement and its important role during the Spanish revolution. In Spanish with English subtitles. Land and Freedom - Ken Loach's 1995 film of an unemployed Communist who leaves Britain to fight in the Spanish civil war. For Whom the Bell Tolls - Ernest Hemingway - Novel of a young American who goes to Spain to fight for the International Brigades. The book shows Hemingway's obvious bias in favour of the Stalinist Communist Party version of events but is still an excellent read. An easily read short critique by Gilles Dauve 'When Insurrections Die' in the libcom library would be a welcome addition to the list here. Can i also suggest he addition of the title "Brigadista (An Irishman's Fight Against Fascism)" Bob Doyle with Harry Owens. Thanks for putting up these readings. Gilles Dauve’s When Insurrections Die also provides an interesting addition to more traditional anarcho-syndicalist approaches to the Spanish Revolution. It would be a great pity if this reading guide merely saw the Spanish Revolution from the viewpoint of anarcho-syndicalist militants, just as a Leninist reading guide might only see the Russian Revolution from the viewpoint of Bolshevik militants (and then justify this censorship on the grounds that any criticism of the Bolsheviks gives comfort to the Right). I appreciate that some people worry about Michael Seidman’s politics. But his views appear to be more a ‘post-modern’ cynicism about collective struggle, rather than any real support for the Right as some critics claim. Furthermore there is no other historian who tries so hard to see things from the point of view of ‘ordinary’ workers, peasants and conscripts. Michael Seidman’s classic book is: Workers against Work; Labor in Paris and Barcelona During the Popular Fronts. Republic of Egos is also very thought-provoking. I have major apprehensions about Siedman's politics, but also the stuff he's written seems somewhat contested. Objectivity and Liberal Scholarship by Noam Chomsky, a chapter in American Power And The New Mandarins. It is also available as a separate book published by AK. From what I remember it has information not published elsewhere on how the non-intervention policy of the Western 'Demoracies' worked in practice. For example the American Government allowed Texaco to supply oil to Franco. There were British warships in Barcelona harbour during the 'May Events' in 1937 in case things didn't go their way, i.e. the anarchist grassroots rebellion (and the P.O.U.M. if I remember correctly) wasn't crushed by the Communists. It may also be the source of the story that 'Fanta' was invented in the 'Nationalist' part of Spain during the Civil War/Revolution as the Spanish Coca Cola subsidiary was cut off from it's American parent company at the time. Lessons Of The Spanish Revolution by Vernon Richards was published by Freedom Press in the 1980s, during their decades long anti-class struggle phase. Stuart Christie has recently pointed the finger of blame again for the defeat of the revolution and the war at the leadership of the anarchists, who collaborated with the Government. The Freedom Press book gives reports of the C.N.T. meetings were all the Government collaborating policies of the anarchist leadership were ratified by the C.N.T. membership. The 'May Events' of '37 and the resistance to the militarisation of the militias show that this could not be entirely true. But even if it is only partly true I probably tend not to take a overly judgemental view. Maybe they knew that the game was up given the totality of the forces stacked against them. Even if Franco, Nazi Germany and Fascist Italy hadn't moslty crushed the revolution the Western 'Democracies' and Russia certainly would have, more overtly later on. I would be quite happy for people to take issue with me over whether the anarchists simply made mistakes or whether anarcho-syndicalism is inherently reformist. On second thoughts maybe not, as it has all been said before. Personally I think it possible to learn the lessons and still be an anarcho-syndicalist. Many of the anarchist organisations that have rejected anarcho-syndicalism have ended up submerged in reformism themselves. Certain other communist critiques still cling on to certain aspects of Marxist Leninism. Bolleten, Burnett. The Grand Camouflage: The Communist Conspiracy in the Spanish Civil War . New York: Praeger, 1961. Expanded as The Spanish Revolution: The Left and the Struggle for Power During the Spanish Civil War . Chapel Hill: University of North Carolina Press, 1979. This book goes into great detail about the civil war within the civil war. It was described to me as more objective that the anarchist accounts of the Civil War/Revolution. However I think most of the details are now available in the anarchist accounts translated from Spanish into English and made available in more recent years. The book was written by an American journalist, who, if I remember correctly was present in Spain at the time. Don't be put off by the title or the nationality of the author. Although it probably was published as part of the Cold War Red Scare, (this is the reason, I think, why Orwell's account has been promoted so much) it is as objective as any mainstream journalism can be. I think it goes beyond that as it takes anarchism seriously and the author has an understanding of what anarchism is, unlike the western 'democratic' historians who have written about the Civil War and down played the role of anarchists and concentrated on the conventional power politics. I probably read about the Spansih Civil War/Revolution or watch films about it about once a decade as I don't think it is a good idea for your political theory or practice to be informed mostly by one event in the past rather than your current experience of power relationships. If you read one half decent book about the Civil War/Revolution in general, plus one about the collectives and one about the Mujeres Libres you have probably read everything you need to know. Libertarias is probably still worth watching despite the racist ending and the intention of the film's director to reconcile the opposing forces in Spanish society, such as anarchism and christianity, into some form of Spanish national unity. I have a strong recollection of reading about the American Government allowing Texaco to supply oil to Franco in Sandoval & Azcarate’s, ‘Spain 1936-1939’, published by Lawrence & Wishart, 1966. I thought the book heavily biased in favour of the Stalinists. ‘Lessons of the Spanish Revolution’ was published by Freedom Press in 1972. I used to have a copy of each book and both were donated to Edinburgh R.L. For me Ronalds Fraser's "Blood of Spain", is a must. Here are the voices of all parties concerned, but even so, show the great constructive work involved in the restructuring of Spanish society in the republican areas. It showed me,as a young worker, the great latent power of the working class. Simulary, Gaston Leval's, "Collectives in the Spanish Revolution", shows the great practical attitude of CNT and FAI militants in solving the problems of introducing libertarian communism in Aragon. I've read somewhere on libcom that Emma Goldman was an individualist, but for me the edited collection of her writings (mainly letters) on the Spanish Revolution 'Vision on Fire' is outstanding. Having experienced the huge tragedy of the Russian Revolution at firsthand ('My Disillusionment in Russia') she maintained her belief in revolutionary anarchism and became the CNT's representative in the UK during the Spanish revolution, maintaining a profound respect and admiration for the Spanish workers, praising the efforts of the rank and file and criticising the collaborationism of the 'leadership'. I don't see any individualism in her writings, only a genuine belief in anarcho-syndicalism, the workers and revolution. The book documents her frustration at the failure of the non-communist left (mainly in the UK, but elsewhere also) to support the Spanish workers, her admiration for the collectives, her personal recollections of personalities such as Berneri and her views on militarisation etc. Forgot to add also, that if you want a tragi-comic read, look no further than William Rust's 'Britons in Spain - The History of the British Battalion of the XVth International Brigade'. Rust was correspondent for the Daily Worker. The contortions he gets into to maintain the Stalinist line on Spain are unbelievable - for instance, some time afterSeptember 1938 he wrote (in the introduction): "The Republican Army, now one million strong and yet to reach full strength, has broken the offensive power of Franco's forces and ... is preparing for further advances". He devotes a considerable amount of words to the need for military discipline - including, for instance, a discussion of how saluting officers reassures the men and binds the unit - an implicit justification for militarisation. Yet he also documents the huge efforts of the fighters themselves, their personal belief in the cause, the price they paid (some actions saw massive casualty rates) and the humility and solidarity they showed in their letters home. It's worth a read, again because you get some first-hand experience, even if it is redacted by the Stalinist mindset. I added Burnett Bolloten's book to the guide. I haven't yet read it myself, but Bookchin praises it quite strongly in his introduction to The Spanish Anarchists and it appears to be very extensive--the "the most exhaustive study on the subject in any language," supposedly. Contemporary eye-witness accounts: Red Spanish Notebook by Mary Low and Juan Brea, City Lights 1977. Mary Low edited the POUM's English language bulletin, and Juan Brea was a Cuban poet and journalist. Counter-Attack in Spain by Ramon J. Sender, Houghton Mifflin Co., 1937. Sender was a CNT sympathizer and internationally famous novelist. His wife Amparo was executed by the fascists. This book is out of print but available from university libraries. AK Press published an expanded English language version of Frank Mintz's Anarchism and Workers' Self-Management in Revolutionary Spain a couple of years ago. Other fiction: The Fifth Column and Four Stories of the Spanish Civil War by Ernest Hemingway, Scribner's, 1969. The Fifth Column is a play (it just had its London premiere last month) and the stories are published in this volume for the first time. Man's Hope by André Malraux, Random House, 1938. Considered the classic novel of the Spanish Civil War. Hermanos! by William Herrick, Simon & Schuster, 1969. Written by a disillusioned veteran of the Lincoln Battalion, this novel is critical of the Stalinists throughout. Poetry anthologies: The Penguin Book of Spanish Civil War Verse, edited by Valentine Cunningham, Penguin, 1980. An anthology of British poets, (you can disregard Cunningham's editorial remarks.) The Wound and the Dream: Sixty Years of American Poems About the Spanish Civil War, edited by Carey Nelson, University of Illinois Press, 2002.